On 11th June, 2017, in the virtual quarter final against South Africa at the Oval, Yuvraj Singh hit the winning six to propel India into the semi finals of the Champions Trophy. The semi final against Bangladesh will be his 300th ODI. He will become just the 19th player to reach this milestone. 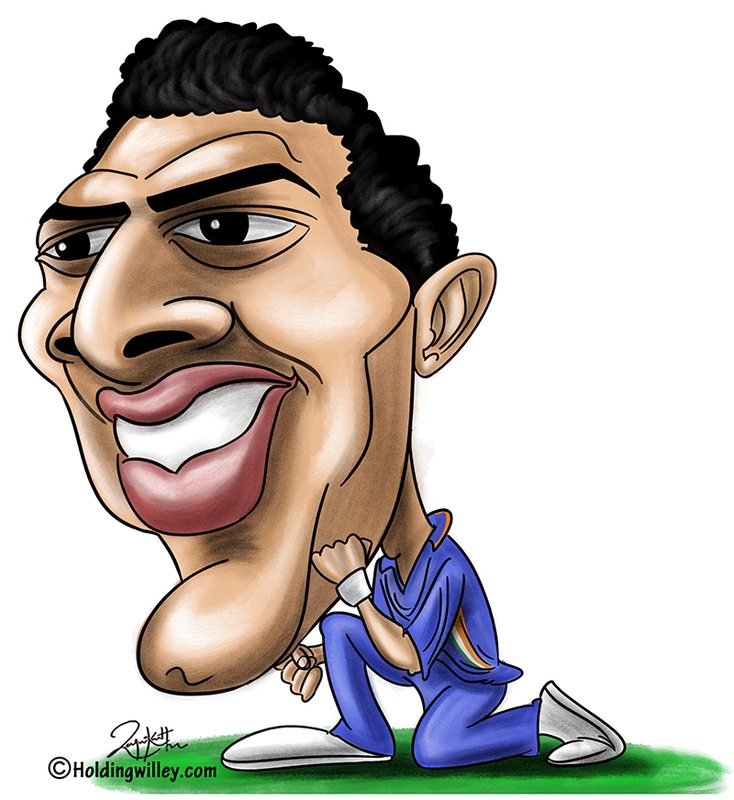 Yuvraj has been a great player for India over the years. He was the Man of the Series in the 2011 World Cup and integral to India’s victorious campaign. What made this achievement even more special was that he was suffering from undiagnosed lung cancer at the time. A lesser cricketer would have been content to rest on his laurels and retire gracefully. However, Yuvraj worked on his fitness and regained form to make another comeback. This is in no way suggesting that one should view Yuvraj just through a prism of sentiment and fighting spirit. Hi career numbers in ODIs also make for some fine reading. Here are some of the stats highlights of his career. Yuvraj is 22nd on the list of runs scored in an ODI career and is one of just 28 players to score over 8,000 ODI runs. That in itself is an admirable achievement. Among these 28 players, he has the 7th highest batting strike rate. This is an august list and for Yuvraj to be near the top amongst players of such pedigree speaks volumes of his greatness. Of the 45 players who have scored 5,000 ODI runs, Yuvraj has the 13th best batting strike rate among them. He doesn’t just score a lot of runs; he scores them quickly. Yuvraj normally bats in the middle order and therefore doesn’t get the opportunity to rack up as many centuries as batsmen who bat higher up. Despite this, he has 14 centuries to his name. This puts him 23rd on the overall list of century makers in ODIs. When the list is filtered to the number of centuries scored batting at the number 5 position and lower, he is at the top of the list along with Mahendra Singh Dhoni. Both of them have scored 7 centuries while batting at number 5 or lower. Prior to the 2011 World Cup, the Indian skipper Dhoni, and the team management decided to entrust Yuvraj with the responsibility of bowling his full quota of overs so that India could play an extra batsman. Yuvraj took on the extra burden manfully and was the main reason for India’s success in the tournament. In the 2011 World Cup, he scored 362 runs at an average of 90.5 and was the 4th highest run scorer for India in the tournament. He also took 15 wickets, which was the second highest for India after Zaheer Khan. Overall, he is the 6th highest run scorer for India in World Cups and the joint 7th highest wicket-taker. India’s victory over England in the Final of the NatWest Trophy in 2002 ranks as one their finest tournament wins in ODIs. India were in a precarious position at 146/5 chasing 326, when Yuvraj and Mohammad Kaif put on a partnership of 121 in less than 18 overs to take India close to victory. Yuvraj was just 20 years old at the time, but played with the poise and maturity associated with a veteran. He has been on the international scene for 17 years. This shows his longevity. There are some players who are good when their team bats first but have mediocre records when chasing a target as they are unable to withstand the pressure of a tense chase. Yuvraj averages 37.19 batting first and 36.44 when chasing which shows that he is equally adept when setting or chasing a target. He needs just 64 runs to score 4000 runs in chases. He is known for those clean sixes that he strikes off both pacers and spinners to all corners of the ground. At the conclusion of the match against South Africa at the Oval, he had struck 155 sixes in ODIs, which is the 4th most by an Indian and the 10th most overall. The number 5 position is the most prolific for Yuvraj in ODIs: he has scored 4856 runs, which is the 4th most at that position after Dhoni, Arjuna Ranatunga and Steve Waugh. In his pomp, Yuvraj was an electrifying fielder and used to man the position at backward point, where he used to pull off some incredible catches and save countless runs for the team. At this stage of his career, he patrols the boundary. There is more to Yuvraj than just mere stats though. He is a lion-hearted cricketer who always gives his best and whose career cannot be defined by just numbers. His majestic batting, useful bowling and scintillating fielding means that Yuvraj commands a place in the pantheon of all-time great ODI cricketers. All cricket fans will be hoping that he can put on a spirited performance in his 300th ODI.